With the PlayStation VR launch just a couple of weeks away, it's looking increasingly likely it could be in short supply in the run up to Christmas. Amazon have recently added a message to their website advising they are now expecting to fulfil customer pre-orders by 12th December 2016. Good news if you need one for a Christmas present, but only if you pre-order now. It's a similar story at Very, where pre-orders are now being advised to expect delivery on 16th December. Argos completely stopped taking pre-orders on the 24th August 2016, whilst Tesco Direct cannot guarantee a launch day delivery. 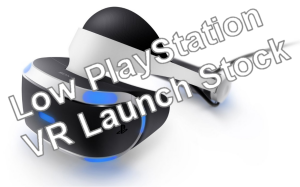 "Pre-order now to guarantee your PlayStation VR product for launch. All customers who have already pre-ordered will receive on launch day." Great news if you haven't ordered yet but don't leave it too long expecting stock will be in plentiful supply, it probably won't be.